This little man will be celebrating his 5th birthday on November 4. I haven't share so much stories about my active, talkative, and smart baby boy. Ayaw na nga pala nya magpatawag ng baby. Hindi na raw siya baby. Yohan is attending school already. He's in Kindergarten 1/ Nursery class. The photo above was taken on the first day of school. He's doing good in school, so far except for slight difficulty in writing. I will tell you more about him in the next blog post. Thanks to Department of Education (DepEd) for allowing the students of public schools (preschool, elementary, and high school) experience a week-long semestral break. However, such school holiday in private schools is upon the discretion of their administration. Thea is now relaxing at home. Oh well, I think my fourth grader has been always on relax mode ever since she started schooling. My husband and I don't pressure her too much to excel on academics. We just remind her to pay attention to their lesson but we never impose on her to be on always top of the class. We tell her that medals and awards come as a bonus for all the efforts done during the entire school year. She has her own learning style. Na-realize ko na, na magkakaiba ang learning styles ng bawat bata, ng bawat tao. Nung bata ako, masipag mag-aral, halos taon-taon kasama sa Top Ten but take note, my parents never pressured me to do so. Hiniling ko na sana ganun din sya. At the end of the day, I realized, hindi pala dapat ganun, may kanya-kanya nga kasing style ang bawat bata. Thea is not a typical school girl, that's what we (her parents) believe. Sabi ko nga, may sariling style sya. As early as now, we already know what areas she well excel. We acknowledge and respect her weaknesses , too but we also remind her to strive on some areas that needs improvement. Medyo mana yata sya sa akin, mahina sa Math, hahaha. 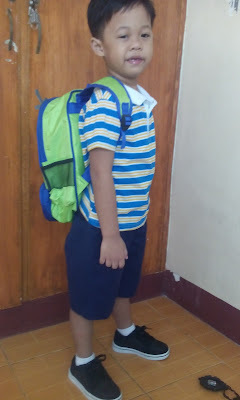 Yohan, on the other hand, went to school today. He's attending pre-kindergarten classes in an NGO-run preschool near our place. Unfortunately, hindi sila kasama sa schools na may sem-break. Semestral break starts today, October 26. Classes will resume on Tuesday, November 3, 2015.